COMAC signs Comprehensive Strategic Cooperation Agreement with ABC__Commercial Aircraft Corporation of China, Ltd.
COMAC signed a Comprehensive Strategic Cooperation Agreement with ABC on September 25th, 2017. 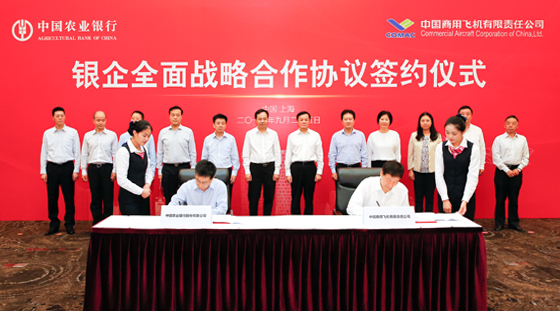 Commercial Aircraft Corporation of China, Ltd. (COMAC) signed a Comprehensive Strategic Cooperation Agreement with Agricultural Bank of China Limited (ABC), and a Framework Purchase Agreement on ARJ21-700 with Agricultural Bank of China Financial Leasing Co., Ltd. (ABC Leasing) on September 25th, 2017. 20 ARJ21-700 orders was signed by ABC Leasing after it had signed a Purchase Agreement on 30 C919 aircraft six days ago at the Aviation Expo/China 2017 (17th Expo). At this point, ARJ21-700 has accumulatively secured 433 orders. Mr. 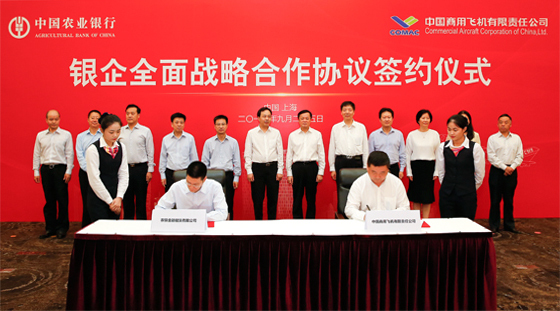 He Dongfeng, Chairman and Secretary of the Party Committee of COMAC, and Mr. Zhao Huan, Deputy Secretary of the Party Committee, Vice Chairman and President of ABC, attended at the signing ceremony. Mr. Shi Jianzhong, Vice President of COMAC, and Mr. Kang Yi, Vice President of ABC, placed their signatures on the Comprehensive Strategic Cooperation Agreement. It is reported that the aim of signing the Comprehensive Strategic Cooperation Agreement between both sides is to serve the demand of the fast-growing civil aviation market in China, vigorously implement the strategy of driving development by innovation, and promote the supply-side structural reform. Both sides will continue to deepen cooperation and work together to implement the national strategy, strengthen responsibility, deepen reform, seek common development and achieve a win-win situation between the bank and the company. Agricultural Bank of China Limited (ABC) is one of the largest commercial banks and major comprehensive financial service providers in China. After more than 60 years of development, it has become a state-owned large listed commercial bank with business across the urban and rural and having the widest service scope, the largest number of service objects, the most extensive business functions, high overall strength and good brand image. It has abundant experience in providing service for large enterprise groups, and has strong competitive advantages in products, science & technology, talents and service philosophy. ABC Leasing is a bank-owned financial leasing company wholly owned by Agricultural Bank of China and approved by China Banking Regulatory Commission. It is registered in Shanghai with a registered capital of 3 billion yuan. It has a business office in Beijing and is entrusted to manage Agricultural Bank of China International Aviation Leasing Co., Ltd. in Singapore. The total assets of the company are nearly 40 billion yuan at present. COMAC signed a Framework Purchase Agreement on 20 ARJ21-700 aircraft with ABC Leasing on September 25th, 2017.